If you're into disc brakes, this is a nice one. Last edited by MMsRepBike; 06-10-2016 at 09:22 AM. ... 'cuz that's how I roll. 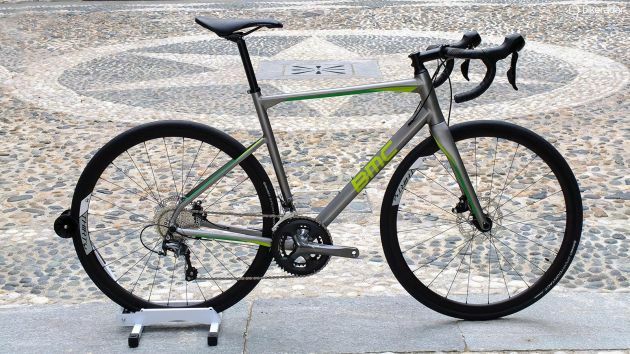 Finally a disc brake bike made by people that have a clue. Rear hub spacing is 142mm, which is the new Shimano standard, **** you SCS. Shimano standard 12mm thru axles. That wasn't that hard to do was it? Also they have the integrated, and nicely done I must add, fender mounts on the alloy ones. The fenders and rack they made for the bike are great. The head tube angle is very slack, making this a very stable bike. BMC was smart to show Cadel carving switchbacks with it to rest the minds of those thinking slack bikes can't turn well. Clearance for 30mm tires no problem. The carbon frames can swap between 140 or 160mm rotors with a slick integrated mounting plate. The frames come with a nice chain catcher built in. The integrated front end on the high end versions is very nicely done. That new design steerer tube/foam setup is pretty slick. Overall it's basically a home run. In terms of what new, modern, disc brake bikes are supposed to have, what is it missing? When are these supposed to be in shops? I'm really keen to test ride one. It sure looks fast. I wonder if this eventually replaces the Granfondo. Racers are going to still want the SLR. This would seem to have the same audience as the GF. If the Roadmachine is as compliant as the GF but faster it's going to cannibalize a lot of sales. At the very least the aluminum Granfondos should be discontinued. This looks far superior for a similar price. I'm very curious to check one out. I hope the 1 BMC shop in my area carries it but I'm sure not counting on it given the limited bikes they carry now. There are eight models in all with a variety of frame colours, and all are in stock and on sale now. Just depends on the dealer and local availability and such. I too own and greatly enjoy a Granfondo. I have my eyes on an aluminum Roadmachine with fenders, but it would be replacing the Granfondo which doesn't need replacing. I'm in no need of disc brakes, especially on the Granfondo which I run aluminum powertap wheels on. So I don't need one at all... but I have my eyes on one anyway. The integrated stuff is only on the most expensive one. There's a lower tier full carbon one without all of the integrated stuff. So if you don't want it, you don't have to have it. The seatpost though... on both carbon versions it's a carbon proprietary post. So yeah. On the alloy versions though it's round and has a standard collar. I have an Aluminum GF-02 whose entire existence has been attached to my indoor trainer. That is the only aluminum bike I'm likely to own. I asked some of the sales flunkeys at the bike shop today when the Roadmachine is going to be available to test/demo. They laughed and said I was about the 10th person that has asked about it since the announcement, so i guess there is some interest. Unfortunately none of the management folks were around, and no one there was sure when they'd be arriving. Yea, I got to ride one for an hour or so last week. I really wanted to hate it, but it was a really great bike. I think they've compromised a little bit of compliance on the back end, especially on the larger frame (I ride a 61) in trade for a slightly more aggressive position and perhaps slightly better stiffness. I'd need more time on it to know exactly how that extends over longer rides and a full season, but so far, so good. I really don't *need* one (my GF-01 is still quite serviceable), but the call of the new and shiny is beckoning me with this. I'll try to resist and see if they come out with some better colors for the model I'd want (Ultegra Di2). I suppose I could live with that dark grey/orange scheme. Last edited by Migen21; 08-12-2016 at 08:24 AM. These differences make the Addict Disc a better all around deal IMO. The HMF Addict bikes have a number of the same features and are as light as the Roadmachine 01 bikes, but priced like the Roadmachine 02. Last edited by Rashadabd; 08-16-2016 at 05:55 AM. There definitely are differences, at least between the 01 and 02 Gran Fondo's. For me, one of my major complaints with BMC is that they are not really forthcoming with the details in regards to the differences in the carbon. 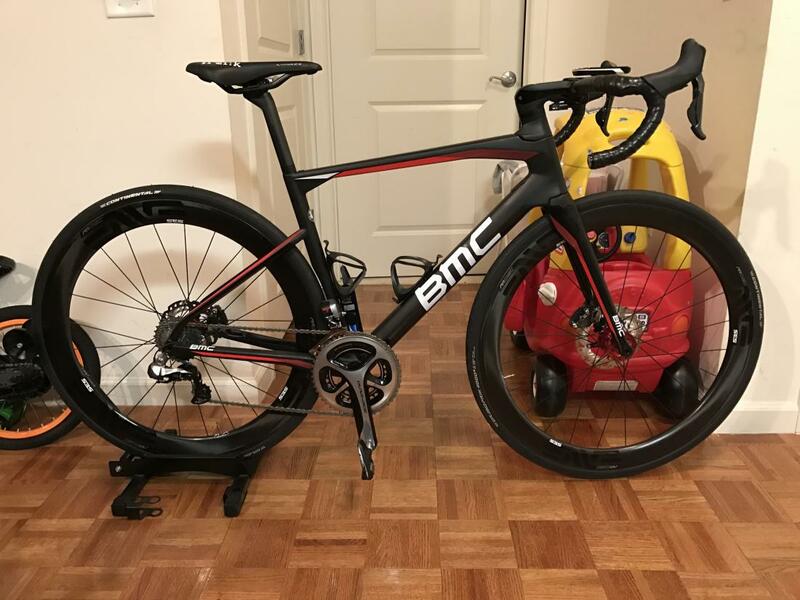 The bike shop peeps have no clue, and when I pressed the BMC rep about the differences (specifically in the carbon), he either didn't know himself, or was unwilling to say. I learned the hard way that the GF-02 was not the same bike as the GF-01, despite the exact same tube shapes and geometry. I rode a GF-01 for a year and a half before it suffered some minor frame damage. When I went to get a replacement from BMC, they couldn't produce a GF-01 frame in my size, and offered me a fully equipped GF-02 at cost (which is pretty darned cheap and cheaper than a GF-01 Frameset alone) and told me they were essentially the same, and that I wouldn't be able to tell the difference. Needless to say, I could feel the difference. While compliance was probably as good, or possibly better, there was considerably less stiffness in the bottom of the bike (chassis/chainstay/BB, etc...). It might not be very noticeable with a smaller/lighter rider on a 49cm bike, but being 6' 5" and 240lbs on a 61cm bike, I could definitely feel the difference. So much so that I had problems with front derailleur rub (frame flex) under heavy power (climbing, sprinting, etc...). I ended up selling the GF-02 (for a steal) to a friend, and got my GF-01 repaired. I'm still riding it today, and love it. I rode the RM-01 for an hour, and was pleased with the feel of the frame. I'd love to spend a couple of hours on both the 01 and the 02 for a side by side comparison, but the shop is not stocking the 02 in my size, at least for now. I'd be very interested to know of the 02 has the same softer feel that the Gran Fondo GF-02 had. It can definitely be tough to tell with a number of manufacturers. You could certainly feel a similar difference between a Cervelo R3 and R5 back when I was riding and testing those. Specialized, Trek, and Giant seem to do a good job of providing a similar ride quality at a more affordable price on their lower end carbon bikes for what it's worth (they just seem to be heavier). Even the Fact 8 Carbon entry level Roubaix bikes rode pretty nice if you are into stiffness and a 5 Series Trek (which they don't seem to make many of anymore) rode as good as anything I ever tried for instance. I actually ended up with a GF-02 because it was more compliant. For me it was stiff enough but really comfortable over bad roads. I also wanted rim brakes and that wasn't available on the GF-01 anymore. I completely agree with your comparison of the 2 frames. I have a feeling it will be the same for the Roadmachine. Unfortunately the last BMC dealer in my area won't be stocking any. It's TM01 and TM02 only. I can order the Roadmachine but I still love my GF-02 so I'm not replacing it for a bike that I can't try out. I just found out my local BMC dealer does in fact have a RM-02 in my size. It's just not built yet. I told them i'd like to ride it, but not until after I get back from a vacation later this month. Please post your impression after you try it. Given how you noticed the exact same things between the GF-01 and GF-02 as I did I really trust your views. It would be very much appreciated. Here's my new ride. Bought the frame set and built it up with Dura Ace 9070 and Enve SES 4.5ARs on 28mm GP4000SII's. So far, so good. Last edited by boogermin; 10-30-2016 at 06:03 AM. I will be picking up the same frameset a little later (late Nov I think). I'll build mine up with a mix of Dura-Ace and Ultegra Di2 and the same wheels as you. I'd be interested to hear back what you think of the wheels after you've logged a few miles (maybe start a thread over in Wheels and Tires so you don't earn the wrath of CXWrench and his minions). I am looking to build a VERY similar bike, same frame, wheels, but wanted to wait for the '17 Dura Ace R9150 groupo. Did you buy from RA Cycles, I saw you were out East? How do you like the wheels? Yup. RA had the frameset available (of course) and were able to build it up. I was running Enve's SES 4.5's before this wheelset, and honestly can't really tell the difference (aside from the braking... never going back to rim brakes). They're bombproof, and relatively stable in x-winds. Paired with Chris King hubs (R45), they spin for a while. I didn't have the patience to wait for DA 9150, so I pulled the trigger a bit early, but I'll be upgrading the shifters/FD/RD/brakes when it's released. I'm enjoying the bike, as it's a good balance of comfort and "performance". Did your frameset come with the integrated garmin mount? Or is that only on the complete DA Di2 bike? I've decided to go for the 61cm frameset (as opposed to the Ultegra Di2 in orange and black). I'm not in love with the colorway. The red over black is OK, but the bright white logo on the downtube does nothing for me. I'm considering having a custom paint applied before I build it up. Or maybe I'll just take a sharpie to it. I'm also going to pass on the new DA stuff. I'll put the 785 shifters, Ultegra FD and RD (for the 32 tooth cassette capacity), and 175mm dura ace 9000 cranks (50/34). Last edited by Migen21; 11-11-2016 at 12:13 AM.